Artist Dawn Dedeaux has chosen Loyola University New Orleans as a host to her city-wide exhibit “STePs HoME.” The steps, which illuminate at night, can be seen on the lawn in front of the Communications/Music Complex, on the corner of St. Charles Avenue and Calhoun Street. Inspiration for the project came from the post-Katrina images of barren steps where homes once stood. There are approximately 20 installations of the exhibit around the city. Other locations hosting “STePs HoME” include City Park, Longue Vue House and Gardens, Children’s Resource Library and Washington Square Park. 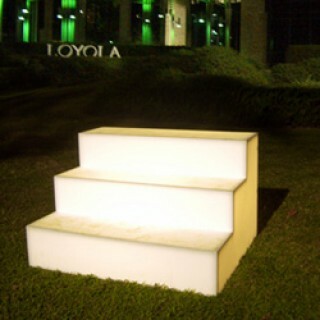 The steps are anticipated to remain at Loyola through the summer of 2009. The city-wide installation was made possible by the Joan Mitchell Foundation and Arts Council of New Orleans. For more information, contact Schleh at karolineschleh@gmail.com or call (504) 865-7248.